Premium shade fabric with leading sun protection. 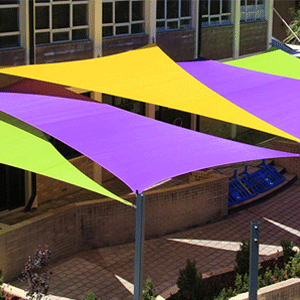 Polyfab is a trusted supplier of premium shade sail fabric and supplies. 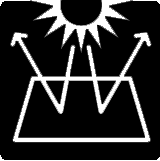 Powered by a state-of-the-art production process, their shade materials outlast the elements and provide effective protection from UV rays. Solar shades made from Polyfab products are ideal for patios, schools and playgrounds, shopping centers, hotels, pools, parking lots, and more. Great for commercial or residential use, Polyfab fabric, hardware, and webbing work together to create high-quality canopies. Choose from nearly 50 fade-resistant colors across three Polyfab shade sail fabric collections. Made from woven High Density Polyethylene (HDPE), each style is made for high strength and tension capability. 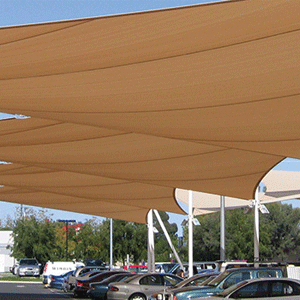 Best for small-scale fabric shade structures, Polytex is durable, flexible, and lightweight. It resists tearing, fraying, and shrinking. Backed by a 10-year warranty against UV degradation. Great for medium-to-large tension structures, this fabric offers over 90% UV protection. It is recommended for commercial installations with unsupported spans of up to 100 feet. Also equipped with a 10-year UV warranty. Architec 400 is a combination of monofilament and Polyfab’s Ovalon™ yarn. The blend gives it high strength, minimal stretch, and tension control. Ideal for large commercial projects, it comes with a 15-year UV warranty. For best results, clean Polyfab shade sail fabrics with Polyfab Pro™ Shade Sail Cleaner. 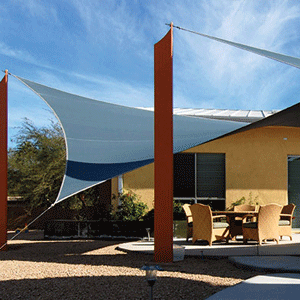 Architectural shade sails require more than just fabric. Fitted shade sail hardware properly mounts and secures the structure. Polyfab Pro shade hardware is made from marine-grade stainless steel 316 and other stable metals. Compatible with HDPE fabric, these high-quality fittings bring tested performance and a long service life. Use to lift, rig, connect, and hold. Explore brackets, bow shackles, eye bolts, and more. In our Webbing & Tape section, you’ll find Polyfab's Shade Sail Edge Polyester Webbing. Made from high-strength polyester, the fabric trim is used to finish the edges of the shade fabric and provide added reinforcement. The webbing is best paired with the three fabrics above. 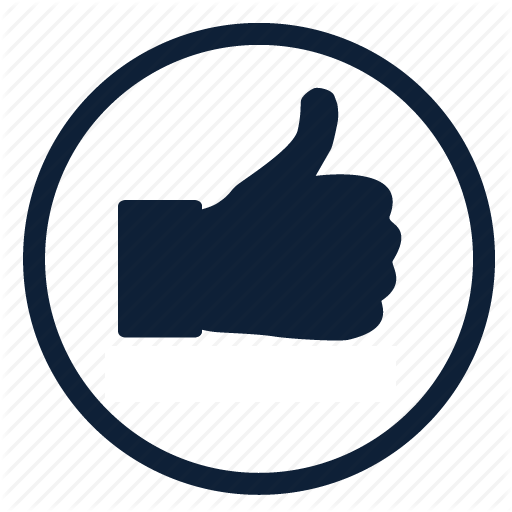 Follow the links below for cleaning tips, sample cards, warranties, and sales.